NISHINOMIYA, Hyogo — Teppei Matsumoto got the maximum production out of two swings of the bat in a historic effort that put Fukui’s Tsuruga Kehi into the final of the National Invitational High School Championship on Tuesday. 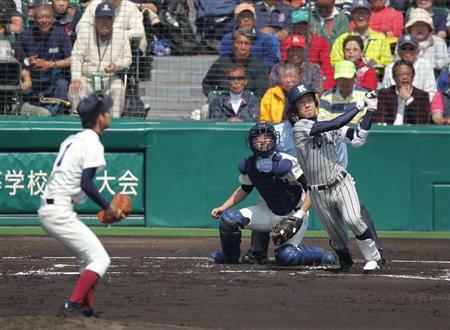 Matsumoto became the first player in tournament history to hit grand slams in consecutive at-bats, doing the feat over the first two innings to power Tsuruga Kehi to an 11-0 rout of Osaka Toin in the first semifinal at Koshien Stadium. In today’s championship game between first-time finalists, Tsuruga Kehi will face Hokkaido’s Tokai University Daiyon High School, which advanced with a 3-1 win over Saitama’s Urawa Gakuin. Matsumoto didn’t start in the quarterfinals, but was put into the lineup to face left-hander Seiya Tanaka. It paid off when he lashed a curve ball into the left-center field stands in the first inning, then sent a fastball over the left-field fence in the second.